Deodorant is one of those STOCKPILE items that you can NEVER have too many of. This week at Kmart, put the Speed Stick Deodorant Coupon into ACTION and add FREEBIES to your stockpile. You'll want this HIGH VALUE coupon to SCORE! Stop by your local KMart this week where they are having double coupons through July 12th up to $2 Value. 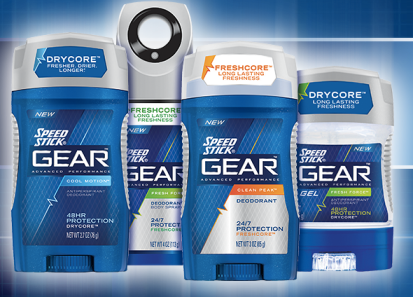 You'll find Speed Stick Gear Deodorant for $3.99, and when you use the $2 off Speed Stick Coupon, it will DOUBLE, making it FREE. For more of the latest deals and greatest steals, stay tuned to The Coupon Centsation on Facebook!